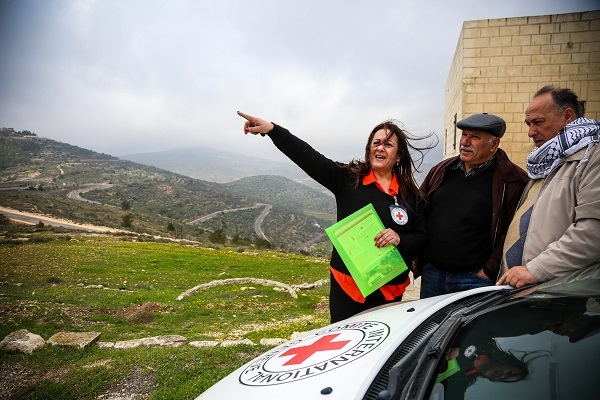 Women play a central role in the delivery of humanitarian aid services. 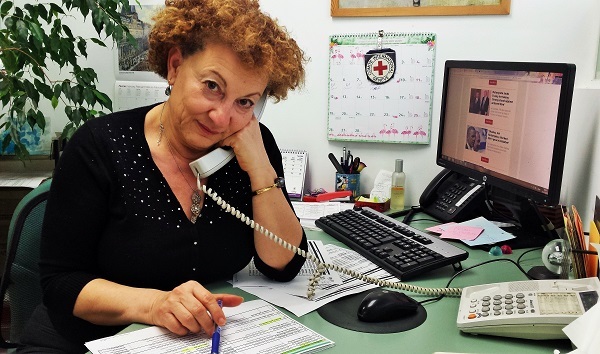 This year we mark the International Women’s Day, with portraits of women at the International Committee of the Red Cross in Israel and the Occupied Territories. They tell about their role and their unique perception of it as women in the humanitarian world. Joelle is seen at her desk speaking on the phone to follow up on permits related to a family visit. Israel, Tel Aviv, 2017. Joelle Natanel. Works for the family visit program run by the ICRC for detainees held in Israeli places of detention. I believe that being a woman and a mother myself, I can better understand the needs of mothers to see their loved ones. To me, men and woman are equal. I have always behaved accordingly, both in my private and professional life. By behaving this way, you can: “Be the change you want to see in world”. 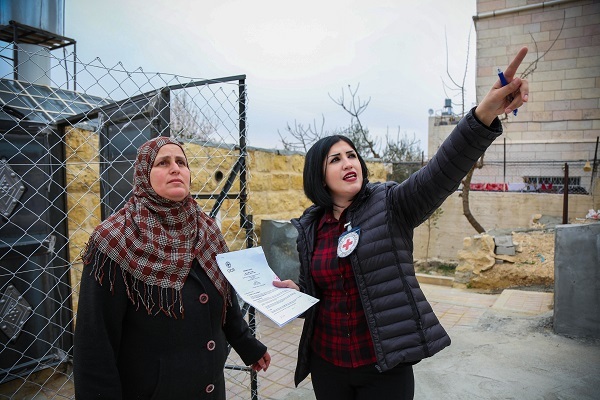 Adaweya Biltaji is seen speaking to a local woman from Hebron, who has approached the ICRC for support. Hebron, West Bank, 2017. Photo: Atta Jabr. Adaweya Biltaji, 33. Protection Officer in Hebron, West Bank. “Within the frame of my work as a humanitarian, I meet people who live under very difficult circumstances. Being a woman allows me to approach the most vulnerable. They seem to open up to me easier. In doing so, I am better able to identify and support their humanitarian needs. The people in my community know me as the “Red Cross woman”. In a conservative society like Hebron, a woman leading a humanitarian response is a bold gesture for a change. It clearly demonstrates that women can do the same work as men, connect with communities and attend to their needs”. Proud to be #boldforchange. Maha Sedawi, Helping separated families connect for 20 years. “When I start a case to help a woman or a child reunite with their family after years of separation, a special relationship is built between us. I understand their situation and their desperate need for someone to take their hands and to fulfil their dream of connecting with their family again. My job is not a regular job; it goes from heart to heart. My work has made me a good role model for my children. They reiterate how proud they are of me and the work that I do, to help people in need. 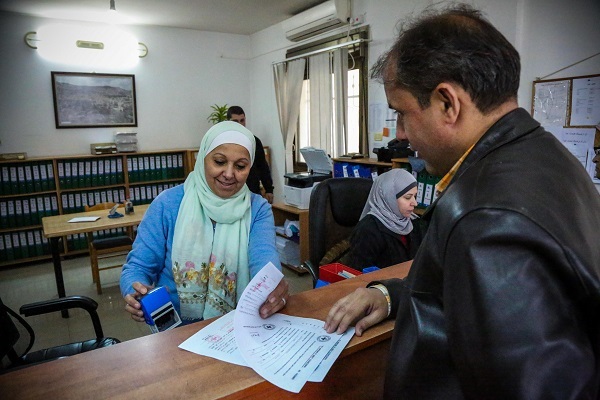 Amani Mahmoud in her office reviewing the permits for the family visits. Tulkarem, West Bank, 2017. Photo: Atta Jabr. Amani Mohammad Taher Mahmoud, 53. Works for the Family Visit Program. A program run by ICRC for detainees held in Israeli places of detention. 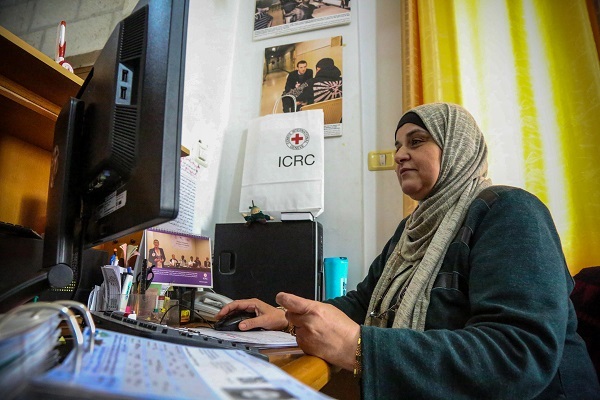 “Working for the ICRC for the past 28 years, has made me a local celebrity. In my conservative home town, some community members might frown upon a woman working in the humanitarian field. You have to be strong and you have to constantly prove yourself. My family is proud of me for all that I have been able to do and for defying the norms of our conservative society. Working in the humanitarian field can be burdensome. People often offload their suffering, frustration and sadness on me and my colleagues. My job is to alleviate part of that suffering by being there, listening and helping to the extent possible. In return, I get to see so much joy and the excitement when mothers, fathers, wives and children get to see their loved ones. It always makes my day. Ghada Zeidan, 41. Mental health worker in Gaza. 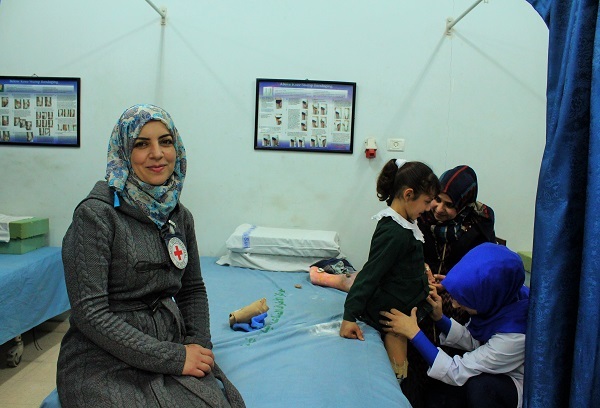 “I work for an ICRC mental health program in Gaza that focuses on amputees”, starts Ghada. She adds; “Humanitarian work has set me free from the politics of the ongoing conflict. I help everyone who needs me, regardless of his or her religion, culture, or nationality or beliefs. Seeing so much misery has also changed my priorities in life. I no longer exist only for my family and myself. I have a far bigger role to play, which is helping others. My husband and children are very supportive and proud of what I do. My daughter is studying medicine and dreams of being a humanitarian worker someday too. I am happy and proud to be a woman. Women should stop seeing themselves as victims of traditions or society. They should stand up and believe in their strengths and capabilities. They should be #boldforchange”. Nana Khalili stamping an ‘attestation of detention’ for a family member. Nablus, West Bank, 2017. Photo: Atta Jabr. Nana Ahmad Khalili, brings joy to people within the frame of a Family Visit Program for detainees held in Israeli places of detention. 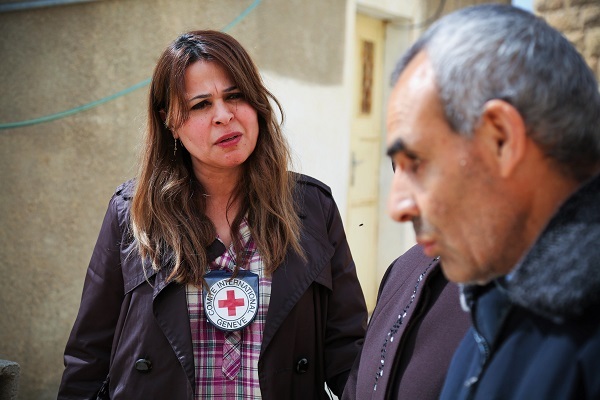 I have been dealing with vulnerable women, ever since I started working for the ICRC in 1987. In my line of work, women often prefer to deal with other women. In parts because they feel more comfortable and at ease to speak about their concerns but also because women connect easier with other women in a conservative society like ours. My job is very important to me. It is an integral part of my identity. What I do is empowering and meaningful. Working in the humanitarian field has shaped me. It has also influenced both my life and that of my family. My children show more sympathy towards victims and people in need. The respect I get from the men and women I work with is empowering. If given the chance, women could change the world to a better place. For that to happen, all forms of violence against women must stop and the quest for full gender equality must be pursued. Suha Misleh with two Palestinian farmers discussing a project for the restoration of their lands. Sinjel / Ramallah, West Bank, 2017. Photo: Atta Jabr. Suha Misleh, 54. Head of ICRC’s Ramallah Office. “Working in the humanitarian field has greatly influenced my life and perspective. It has made me see the positive in almost everything”, says Suha. She adds; “I joined the ICRC as a secretary some 33 years ago. Today, I am proud to be the Head of the Ramallah office. Courage, integrity and patience have been key ingredients along the journey. I believe that women are natural leaders. Living in a patriarchal society makes it harder no doubt for women to live up to their full potential. Fortunately, change is looming and women are finding more and more opportunities. We’re however not there yet. The change must begin from within. Parents, governments, employers have to all pitch in to empower women and pave way for a more equal world”.